CHICAGO – You get to middle age, teetering on the verge of grizzled veteran, in the blink of an eye in professional sports. Seems like yesterday rookie Blake Griffin was taking the NBA by storm and jumping over cars and now, here he is, the guy everyone on the Pistons looks to in the lonely moments when games are won or lost – or before and after games and all the other instances when a team’s identity takes shape. The superman aura Griffin once projected has been dulled by the taint of injury, Adonis revealing an Achilles heel as big chunks of time were lost, and now he’s holding every moment close to his heart. Griffin has fully emerged not just as the Pistons star – and, yeah, he’s playing at an elite level now, averaging 29.5 points, 10.0 rebounds and 5.5 assists on 50 percent shooting – but as their unmistakable leader. It might have happened sooner but for the circumstances. Griffin was air-lifted into Detroit last winter, uprooted from the only NBA home he’d known in mid-season, leaving the Western Conference for the first time. He barely knew his way around and never really got to play with the team he anticipated surrounding him. Four games together – that’s what Griffin had with Andre Drummond and Reggie Jackson last season. But this season – with a full summer under his belt and months to grow familiar with his surroundings and comfortable with the notion of commanding the room – Griffin projects the sense of a man at ease with his role and the expectations placed on him. He attacked this summer with a mix of surgical precision and unbridled energy, starting in the gym in May while the second round of the playoffs was unfolding after injuries kept him away from the court until August the past few summers. Dwane Casey watched some of those workouts and knew he had something special, something more than even he anticipated having even after watching Griffin put his mark on the NBA over the past many seasons. Casey has been around some guys who have or will have busts in Springfield someday and he’s already come to group Griffin with them in important shared characteristics. Griffin juggled mixed emotions after the game – happy to be in the winning locker room, chagrined at the way the Pistons flirted with defeat. More relevant to his role as leader, his voice was heard as to the dangers of such flirtations. Too many times over the past few seasons, as the Pistons improved the roster bit by bit, they let momentum-building wins evaporate and saw pivot points in a season turn against them. Griffin is doing his best to be proactive, to warn against any dropping of their guard. He doesn’t want them easing into the season but to display an urgency now instead. If the Pistons have had such leadership in their recent past, it hasn’t been voiced by someone who can lead from the front. The mantra that’s rippled through the coaching community forever still rings as true as ever. When your best player is also the one to hold teammates accountable, you have a good locker room. In the two great eras of Pistons basketball, they surely had that. The Bad Boys were rife with those types, starting with Isiah Thomas, and the Goin’ to Work Pistons had a unique collective leadership as egalitarian in nature as their box-score contributions. 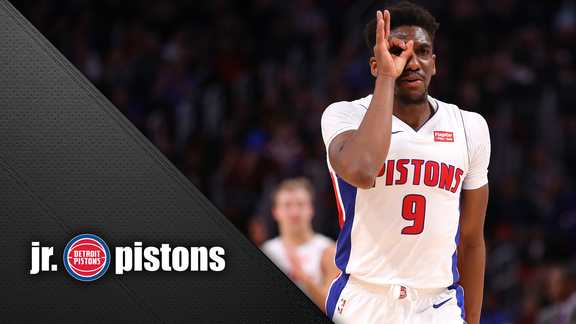 It’s too soon to project that level of greatness on these Pistons, but they’ve got one critical ingredient nailed. Blake Griffin – healthy and feeling at home – has established himself as their driving force. It’s going to be fun seeing where it takes them.